Soleil Zeuhl is the reissue arm of the Soleil de Gaïa label which released the Murder In The Cathedral album. 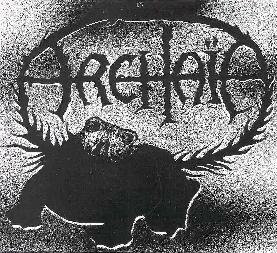 Archaïa is their first release and reissues an apparently rare and much sought after French release from 1977. The CD was remastered from the original master tapes and also includes an unreleased studio track from 1978 and two live tracks from the same year. Archaïa was formed by Magma fans and while there are clear Magma traces in Archaïa's music this is far from being a Magma clone. The intensity and vocal style of Magma is present. But the band draws more on psychedelic influences making this something of an intense cosmic Magma-esque prog-psych trip. The guitar has a wild fuzzy sound and the synths an eerie Twilight Zone quality that gives the music its psych edge. The music as a whole is more along progressive lines being characterized by varied tempos and meters and moving rapidly through a series of themes. The band especially likes to explore more other worldly atmospheres. Sometimes a chanting Middle Eastern bazaar, at others a haunted house of screams and creaking doors accompanied by frightening but classic keyboard sounds. The songs really flow well from one to the other and I couldn't imagine not listening to this in one sitting. Possibly most exciting of all are the two live tracks from '78. The music is far more intense than anything from the studio album, due in part to the wildly swirling keyboards and deep bass and drums. These tracks are less overtly psych influenced and perhaps stray a bit into fusion territory though the fuzz guitar is still present. Great bonus tracks featuring a side of the band that never appeared on an album. In summary, psych fans who also dig intense progressive rock will love this disc. A gem from the 70's that almost got away. For more information you can visit the Soleil Zeuhl web site.